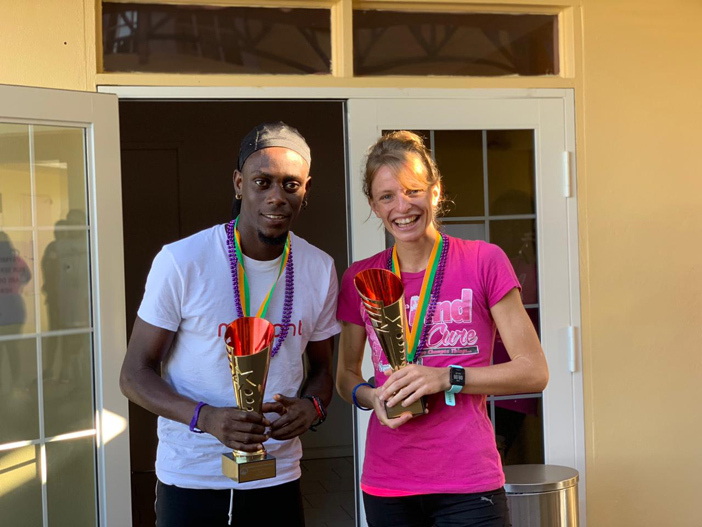 Sherwin Paul and Katrina Lndsay brought thecurtains down on the Virgin Gorda Leg of the 23rd Mourant/H. Lavity Stoutt Community College Series on Saturday by shattering both the men and women’s division records, as participants also walked/ran to promote breast cancer awareness and domestic violence. 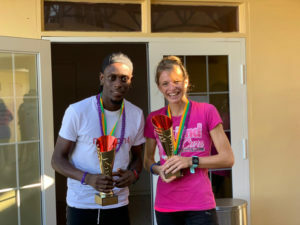 Paul, a barber who cut his way to win the opening race in 11 minutes and 14.82 seconds then missed the second race, returned to demolish Renold Brown’s 15 year old mark of 10:28.3, with a time of 10:00. 29. In a similar fashion, Katrina Lindsay who broke the Women’s record in Race #1 with a time of 12 minutes 19.79 seconds, ran 37 seconds faster, stopping the clock at 11:48.38, to claim the overall women’s victory in the finale. Paul and Lindsay were joined by outstanding participants Charli Seddon, T’Khoy Morton, Mekhi Waters, Kaelyaah Liburd, Mariah Christian, Kavari Bailey in their respective divisions. For a second consecutive year, Ciboney Centre for Excellence was crowned the Primary Division champions, while Bregado Flax Educational Center’s O’Neal House, fbecame the Secondary Division champions. Race Director Stephanie Russ Penn extends on behalf of HLSCC continued gratitude to the Virgin Gorda Community for their support of the event. Special appreciation is also extended to the Virgin Gorda, Rotaract Club, the Valley Sound Lions and Blu Water, for their assistance during the series and the awards ceremony. The curtains will come down on the Tortola leg of the series in Paraquita Bay, at 7 a.m. on Saturday, November 3. Registration begins at 6:30 a.m. and race start at 7:00 a.m.
Age 40-49 Males: 1. Rainford Legair. 2. Claudius Rhymer. Primary School Division: 1. Ciboney Centre for Excellence. 2. Robinson O’Neal Memorial Primary. 3. BFEC Parker’s Panthers. Final Results. Two Mile, Men: 1. Sherwin Paul, 10 minutes, 00.28 seconds. (New Record. Old Record, Renold Browne, 10:28.3, October 23, 2003. 2. James Ramprashad, 11:38.91. 3. Rainford Legair, 12:06.14. 4. Emrol Amsterdam, 12:28.77. 5. Claudius Rymer, 12:45.42. 6. Clinton Simmons, 13:30.99. 7. Kavari Bailey, 16:02.86. 8. Gumption Creque, 16:34.60. 9. Terrol Daniel, 22:23.24. 10. Vincent Wheatley, 24:13.15. 11. Steve Lennard, 27:13.83. Women: 1. Katrina Lindsay, 11:48.38. (New Record. Old Record, Katrina Lindsay, 12.19.79, September 22, 2018.) 2. Mariah Christian, 12:58.64. 3. Rosmond Johnson, 13:41.84. 4. Rea Vanterpool, 21:51.20. 6. Suzette Farrington, 24:04.2. 7. Christina Yates, 28:54.22. 8. Lynell Maduro, 36:33.82. Also participated was Lori-Jean Stevens, Doriel Riviera and Vanessa Rymer. Primary School Teams: Bregado Flax Education Centre Primary Division Houses: Levons Leopards (LL) Parker’s Panthers (PP), Steven’s Stallions (SS), Ciboney Centre for Excellence (CC), Robinson O’Neal Memorial Primary (ROMP): 1. Noah Fox (CC), 16:39.02. 2. Charli Seddon (CC), 18:04.44. 3. Eva Fox (CC), 18:04.77. 4. Dikya Thomas (ROMP), 18:08.18. 5. T’Khoy Morton (ROMP), 18:37.55. 6. Jaden Abrams (P), 18:58.87. 7. Jadon Abrams (L), 19:38.79. Points: 1. Ciboney Centre, 6 (3 participants). 2. Robinson O’Neal Memorial Primary, 9 (2 participants. 3. BFEC Parker’s Panthers, 6 (1 participant). 4. BFEC Levon’s Leopards, 7 (1 participant). Scores: 1. O’Neal House, 1 (1 participant). 2. Harrigan House, 2 (1 participant). 3. Harrigan House, 3 (1 participant).